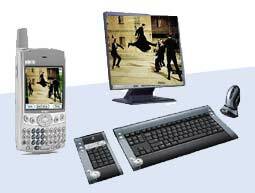 No wires, nothing to connect, just place your Treo in proximity (up to 20 feet) to your monitor and you're done - that's your next PC!!! Thus the Treo Zen acts as a thin-client and all the actual application processing can be done remotely... You could then do everything you currently do on your PC like watching movies, listening to music, playing games, working (of course), shopping, access information and services and all the countless other things that we currently or in the future will be doing via a digital network. Now that I hereby reserve all copyrights for this article and idea I hope that I'll soon be able to get a small share of this future business... and share it with all my fellow treonauts! You nailed this one Andrew. Congrats! !